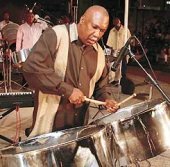 CAREER: Sharpe was born in St. James and grew up in a home where the premises were used as the practice arena for the Symphonettes Steelband. Thus, he was exposed to pan music at a very young age. He began his steelband career with Starlift where he later became an arranger and began composing music. In 1974, he left Starlift with tuner Michael Phillips and other panmen to form a new band, Phase II Pan Groove. In 1987, he composed and arranged "This Feeling Nice" for Phase II Pan Groove and made history when he became the first arranger to play his own composition and win the Panorama competition. He repeated this feat with Phase II Pan Groove in 1988 with his composition "Woman Is Boss." He won consecutive Panoramas in 2005 and 2006.